Client portals help businesses in sharing their customers' sensitive financial data, without exchanging emails. Once you activate the client portal for your contacts, they will be able to download documents issued and review them at any moment, in a more collaborative and secure environment. Essentially it's a private website that contains all financial transactions that have taken place between you and your clients, over which you can have complete control since you get to choose who gets access to it. In particular, Elorus's client portal is very simple to use, as your client can login with their own password set and review your transactions' records including estimates, invoices you've issued and their current balance. Moreover, they can pay you online, provided that you have active payment gateways in Elorus. To send an invitation, you must first verify your email address via the link you received upon registration. The maximum number of invitations to customers is 40 per day. In order for your clients to access all the above, you will have to send them an invitation following the instructions given below. Inside each client's contact, you can invite them from two points. 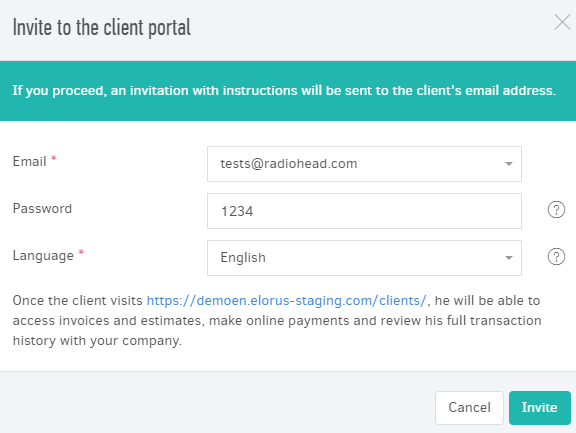 By clicking on "Send invitation" the following window will open where you can enter an optional password for your customer and the interface language of the portal (Greek or English), as appropriate. By clicking on "Create password", the client will submit a password, if you haven't set one for them upon invitation. After accepting, the invitation's status inside the contact is updated, as you can see below. This way, you know to whom you have given access to the client portal, at any given moment. From the same point, you can choose to "Revoke invitation" whenever you see fit and the owner of the email address will no longer have access to the portal. 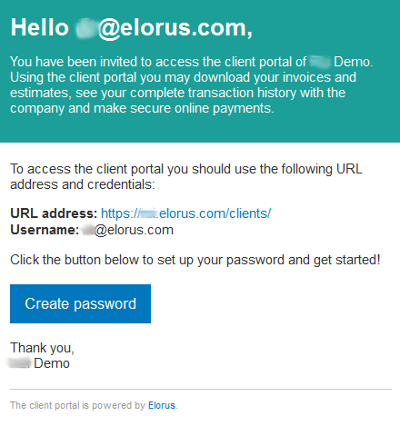 After this simple process, your client is now be ready to log in to the client portal via the unique permalink for your organization's portal (mycompany.elorus.com/clients/), using their email and password created upon invitation. Τhe first page your customer sees is similar to the one shown below. The portal's dashboard provides aggregated information in the form of indices, describing your business relationship. Credit: The total amount of outstanding credit documents which have not been paid to the client (ie. pending refunds) or haven't been paid off by sales document yet. In the amount due index there is a "Pay now" button and by clicking on it the client is able to pay off the full amount owed to your company online. You default payment gateway(s) is/are used to complete the payment process. 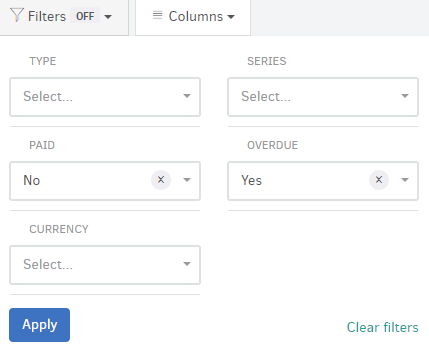 Once the payment is completed, the related receipts are automatically generated for the respective documents and you get notified by e-mail, as well as, through Elorus's interface notifications for this action. 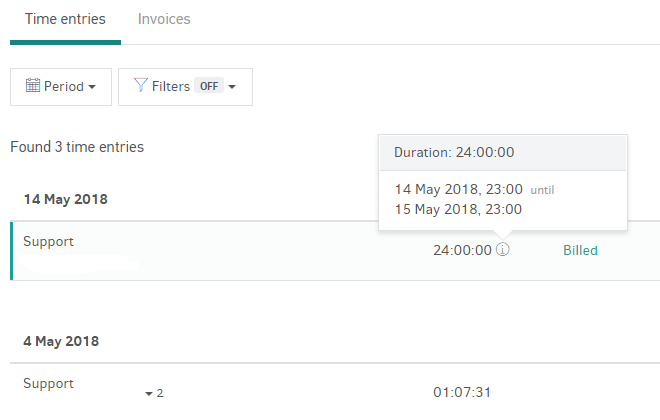 From here, customers can review all sales invoices issued to them and using the "Period", "Filters" and "Columns" option they can obtain a list of focused results. From the "Period" button they can select the desired time for which they want to see results. From the "Filters" button they can narrow down results on the list depending on the options given. Finally, from the "Columns" option they can choose the columns that will appear on the list. If the customer clicks on the number of a document from the list, they will see a page similar to the following. On the document's preview page your client can see information about its current status (Issued, Paid, Void, Overdue, etc. 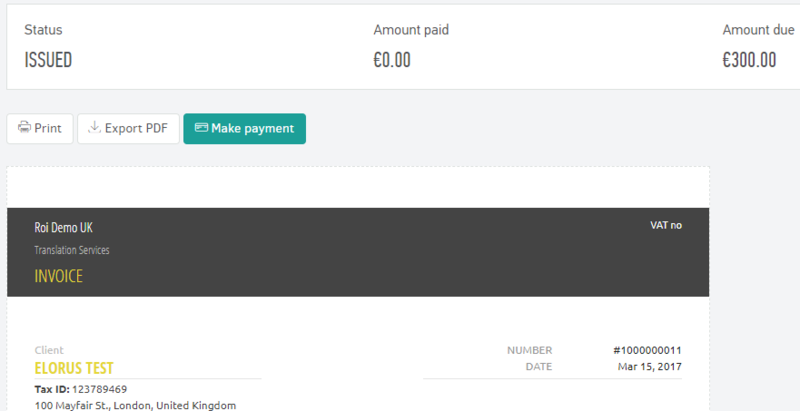 ), the amount paid and the remaining amount. Your clients can also print it and make an online payment, provided that there is an active online payment gateway, connected to the document. By clicking on "Make payment" your client is redirected to the online payment provider's environment to proceed with the payment using a credit/debit card or their account, if registered to the payment provider. 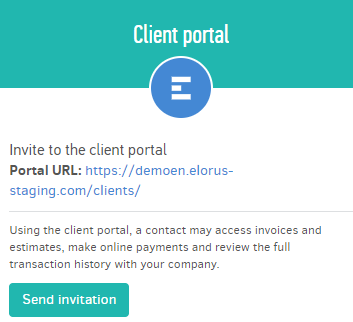 Every time the client views the document through the client portal, either by clicking on the permalink or simply previews it, Elorus will display this information as a notification inside your account. Also, the same information (date and time of view) is also recorded in the record's history so you can refer to it at any time. For more information about online payments, visit the related article. Clicking on this menu your customer can review the list of all the estimates you have issued to them over time. Through the client portal, the customer has the option of rejecting or accepting an estimate. By clicking on "Accept", a window is displayed in which they can, optionally, leave a comment (for example, delivery in 15 days). If the client clicks on "Reject" you get notified of the client's action via email and the estimate's status changes to "Rejected" immediately. This menu appears only if you use the Time tracking feature and have set your projects to be visible on the client portal. See more about this setting here. What the customer sees here are the projects you have created for him as well as the time entries you have logged so far. Specifically, they can either view all time entries or just the billable ones (depending on what you have selected in each project). They can also see a graph of how time entries are allocated over time or how many of them have been billed. Below, they can view the time entries per project in detail and filter them by period, status and task (if any). In the next tab, the customer can view the sales documents issued and are related to the project. In this menu, your customers can have access to credit notes issued, to preview and download them to their computer. In this menu, your client can browse through their contact statement. This way you can facilitate accounts reconciliation and your customer can refer to their entire transactions history at any moment. Choosing a reference period, your client can have an overview of records and be informed about their total balance. They can also download this report to Excel or PDF files by clicking "Export". From the settings menu, your customer can change their password used to connect to your organization's portal and the portal's interface language. 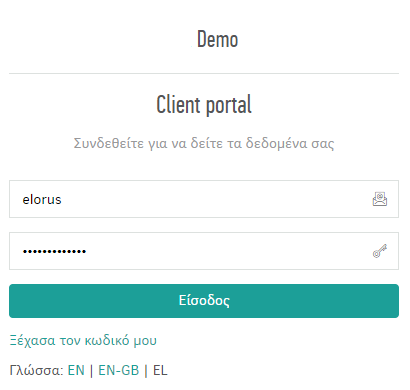 The portal is available in two languages, Greek and English. Also, from the relevant fields your client can change their company information, should any changes occur (eg change of billing address) and this change will automatically update the customer's contact inside your Elorus account. Thus, future documents to this contact will have the updated information, without affecting past records. To discover all the benefits for your company, visit our client portal page.